Cherry Pools is a burgeoning indie-pop outfit hailing out of Toronto, ON helmed by lead singer Martin Broda. Awash in vintage synths, revved up by 21st century guitars, and swagged out in chic thrifted threads, Cherry Pools harness harmony between distinct eras. Cherry Pools represents the culmination of a lifelong artistic journey for the musicians involved. Most recently, they operated under the moniker of Curses, built an international fan base through rigorous touring, and earned the endorsement of Alternative Press, Exclaim!, and more. In 2017, they underwent a pronounced progression and turned his attention towards fusing the sounds that impacted them the most from their formative years through today. Under the influence of Phil Collins, Michael Jackson, Justice, MGMT, Tame Impala, and more, the four-piece arrived at a creative cross-section of inspirations. 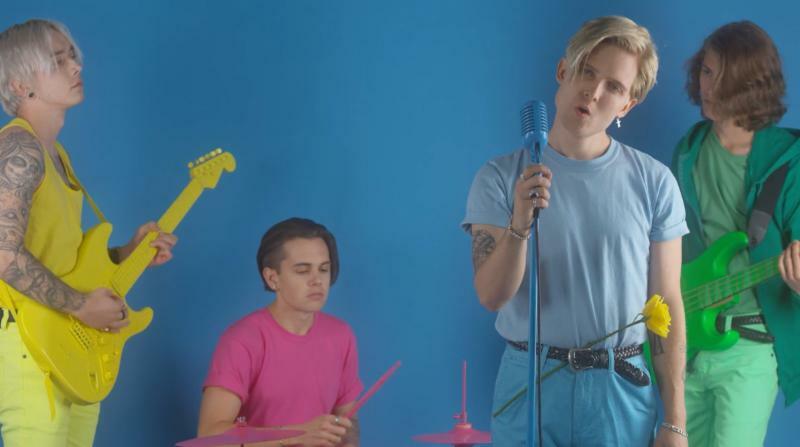 Cherry Pools recently released a video for their brand new track “Are You In Love” via Weekday Records/Sony Music. Produced by the JUNO and MMVA award-winning Anthony Kalabretta, the pop-rock soundscape and the colorful Raul Gonzo-directed video offers a witty juxtaposition to the emotionally charged lyrics: “Are you in love with anyone else? Because the thought of it, my dear, might bring me to death.” “Are You In Love” is available for streaming and purchase now, watch the “Are You In Love” video HERE. Hi there, thanks for having me be a part of this! This interview currently finds me in cold Toronto, Canada but I will be making the move to sunny warm Los Angeles, California in under a week, so I’ll take the remaining days of winter I have to endure aha. One song we are all loving right now and this is going to sound super cliché but it did get us hyped before every show was God’s Plan – Drake. One song we all disagree about loving right now is Bat Country – Avenged Sevenfold, it’s kind of an inside joke with our guitarist. 2018 has been absolutely unreal so far, we just got off our very first tour in America with PVRIS and we gained a lot of new fans that have been super supportive so far and its crazy to think that we only have two singles out so far aha life has been crazy and going fast but in the best way possible. One musical goal for this year is that I would like to see is that this band play to as many faces as we possibly can. We are still a very new band and the general response even from this last tour was that people have never heard of us before the show but have become fans as soon as we walk off stage. So I’m positive that if we play as many shows as we can in 2018, we will be in a much different spot coming into 2019. This band was a little different in the sense of how it formed, I basically found all the members online on social media. So we never really knew each other before this but I think we can all unanimously say that when we had our first practice together, we all knew right away that there was something special. The name process was another challenge for sure, we must’ve went through 1000 names, not even being sarcastic. It wasn’t until I was hanging out at the studio by the pool in the back with my feet half in the water, when the name stood out right in front of me. There was a cherry pool floatie in the pool and the rest was history. I am curious to know how the sound of Cherry Pools compares to that of your previous moniker, Curses? Can you elaborate on merging the modern and vintage sounds for this new band? To be quite honest, Curses had its own identity and even though it was an evolution of Cherry Pools, I still treated both projects with their different needs. Curses was more of an indie rock outlet, whereas Cherry Pools is more in the pop lane. The aesthetics were also very different as well but one thing they kind of both shared was the merge of vintage and modern sounds. I definitely pull from influences I was raised on when writing music such as artists like Whitney Houston, Phil Collins, David Bowie but also pulling from current artists such as Tame Impala, MGMT, TNAF. But the fundamentals of Cherry Pools is to make sure there is no recipe or rules when writing music. If we want to add a cheesy sounding 80’s synth in a chorus and have a super modern effect on a vocal at the same time, then so be it and that’s the beauty of it all and this band. Let’s talk about your very catchy single “Forever Young.” What was the inspiration for it? How creatively involved were you all with the making of the video for it? So the cool thing about this track specifically was that the same person I co-wrote the song with, I also had the pleasure of co-directing the music video with. He goes by the name of Daniel Ciccotelli and he’s kind of an unknown member in this project. He understands my vision, the sound and the aesthetic so we work super well together and we collaborate on as much as we can. The inspiration for this song was essentially to create an modern/vintage anthem for the youth. In my opinion I feel that this song in particular is the perfect song to be introduced to Cherry Pools with because it contains all elements of this band that you can hear and feel in a 3 minute song. Do you have plans to release more new music and a full-length album of new songs soon? Are you currently writing them? Absolutely, we are actually in the demo-ing stage for the next album we release, so as we roll out our debut EP we are getting a head start on the next batch of songs. It might seem a bit early cause the world has only heard 2 songs from us but we are taking full advantage of this time and making sure the next album is absolutely perfect. What has been a favorite show of yours in the past? What would you say makes an ideal performance for this band? I would definitely have to say my favourite show so far has been the very first show of this last tour at the Buckhead Theatre in Atlanta, Georgia. We got to play our first show as a band to 1000+ people and the response from the crowd that night was super memorable. An ideal performance for this band would have to be summed up in 3 words: vintage, pastel and vibes. Social media has been a key factor not only connecting us with fans but without social media, this band wouldn’t even be a thing cause I found each member online. Aside from that, this band has a strong aesthetic that we like our fans to resonate with and one big outlet for that is social media. Primarily I take the reigns of doing most of the maintaining but we all play a certain part in keeping everything in order online. Unfortunately some of my favorite artists that I would’ve loved to work with have already passed away but a favorite artist that I’ve been into for a while now that I would love to work with sometime would be Miguel. His style is something that I’ve always admired and his vocal melodies are just on point. 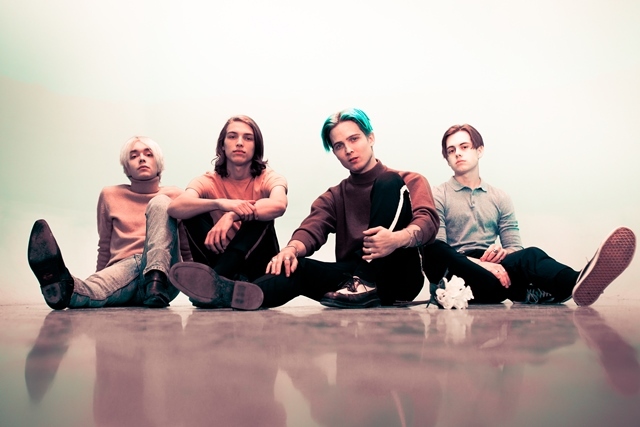 Some favorite artists of mine at the current moment are: The Chain Gang of 1974, Daniel Caesar, The Drums, dvsn, Great Good Fine Ok, LANY, Pale Waves. A dream collaboration for this band would have to be with Chris Martin of Coldplay. I’ve been a huge fan of his for a while now and he is a super talented singer/songwriter. I personally love the mayhem of it all but if I were to choose just one, I think we can all agree that we all love to be on the road performing and meeting fans every night. There’s something very humbling and special from writing a song, then recording it, to performing it on stage and then having fans come up to you after a show to tell you how much our songs mean to them. I honestly cannot see myself doing anything else in this world but to create music and perform it, it truly gives me joy and a passion that never feels like a chore. I’ve worked a handful of normal jobs and I just keep coming back to one thing which is music. And with all the negative happening in the world right now, I really feel people are looking to music now more than ever. The power of music is such a beautiful tool to help cope, bring about change and inspire and my goal is to do all three. My message I hope people take away from our shows/music is simple, I want everyone young or old to feel connected to it however they want. Music is beautiful in that regard, it is up for self interpretation. I never want to have to steer someone’s emotions in making them feel a certain way, I essentially just want to be a seatbelt and have the listener know that we are here whenever they need us.